Professor James Gelvin examines 70 years of U.S. policy in the Middle East. 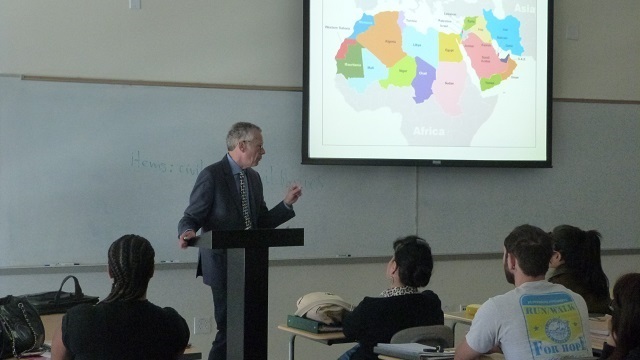 UCLA History Professor James Gelvin addressed the Global Vision student conference at West Los Angeles College with a presentation on The Significance of the Middle East. About 50 students attended the talk and stayed for an enthusiastic question and answer session afterward. Gelvin discussed American policy toward the Middle East from the end of World War II through the Obama administration. According to Gelvin, although the Obama administration has received criticism about its Middle East policy, it was actually based on the policies that had brought the United States victory during the cold war. It was the policies of the three post-cold war presidents who preceded him—George H.W. Bush, Bill Clinton, and George W. Bush—that deviated from them. During the cold war, the United States acted as an “off-shore balancer.” That is, the United States depended on its partners in the region—pre-1979 Iran, Saudi Arabia, Israel—to maintain the status quo and prevent the spread of Soviet influence. The United States provided them with military cover should they require it. After the cold war, the United States intervened directly in the region. George H.W. Bush did so with the Gulf War, Bill Clinton by trying to isolate both Iran and Iraq—the dual containment policy—and George W. Bush with the invasion of Iraq. The result was American overextension in the region. Although Obama has tried to return to off-shore balancing, he has met resistance from America’s partners, who got used to “free-riding” and resented having to participate in their own defense and the defense of the region. Hence, America’s current strained relation with some of those partners, particularly Israel and Saudi Arabia. The new global studies program at West Los Angeles College offers Associate Degrees and Certificates in African, Asian, Latin American, Middle Eastern, and International studies, with separate tracks for students planning to transfer to the University of California or California State University. Three of the UCLA International Institute’s research units, the Center for Near Eastern Studies, the Asia Institute, and the Latin American Institute, are enriching the West L.A. experience through participation in such events as this annual conference. When is Migration a “Crisis”?